In this solo cooking adventure, Kate eschews takeout when she sees something that triggers her desire to whip up something simple, quick, and very delicious. But my grand plan was foiled when I stopped by the Park Slope Food Coop that morning to pick up coffee and was seduced by the produce section. I saw how pretty the broccoli rabe looked. I remembered how easy this dish is and that I had yet to make it for bf who is easily impressed. I thought of the chewiness of the pasta and the sweetness of the dried fruit against the slight bitterness of the rabe, and I was a goner. It would ultimately be more satisfying, cheaper, and healthy I reasoned, and would still manage to feel like a treat. All of the sudden, takeout had lost its lustre. The broccoli sits pretty while the golden raisins plump up in the white wine. There are many ways to go with the basic idea of this dish, but because I had a guest, I went the more decadent route this time. I used white pasta, plenty of olive oil to sauté the broccoli and garlic in, two kinds of cheese (simply because I had both on hand): pecorino romano thrown in with the broccoli for salty sharpness, and parmigiano reggiano on top for salty nuttiness. 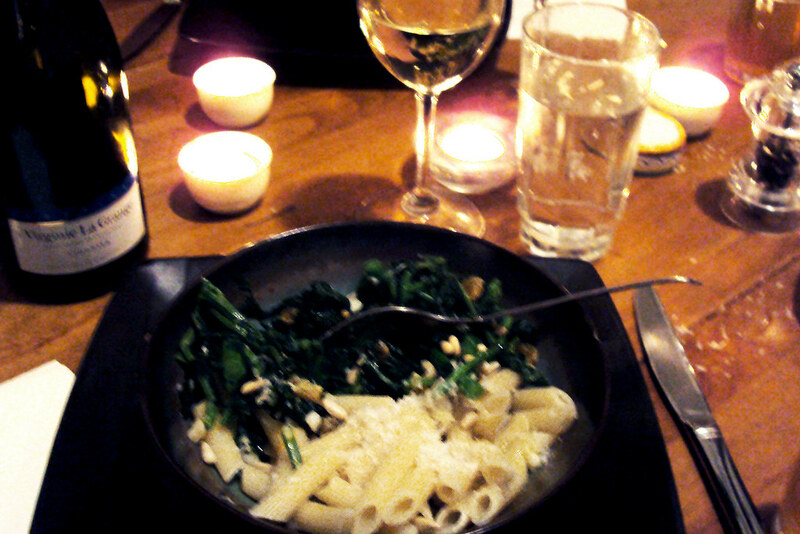 A moment of inspiration prompted an extra drizzle of organic italian extra virgin olive oil on top to finish it off. It came out the best it ever has–a bowl of decadent, textural, flavorful joy. We both went back for seconds… and then thirds. We washed it all down with a bottle of viognier and were like takeout schmakeout. The extra drizzle of olive oil on top brings it to new heights. I make a version of this for dinner every couple weeks or so, often when I get home from work late and I’m too hungry to make something elaborate but want to feel like I’m eating real food. It is super easy and fast and takes zero prep; it’s not so much cooking as throwing some yummy stuff together. It’s crazy versatile. I often change out the broccoli rabe for some other veg (I’ve used cauliflower, regular broccoli, kale works just as great– you just don’t blanch it first). I can make a single portion if I don’t want leftovers (just throw a cup or so of pasta in to boil). It can also be made healthier by swapping out whole wheat pasta for the white. You can cut down on the oil. You can even skip the cheese and make it vegan and not miss all that much. The sweetness of the raisins and rich silkiness of the pine nuts and olive oil are treat enough. However you do it, it packs a lot of flavor and texture for very little effort. Serves 2- 4, depending on hunger levels and what else is being served. 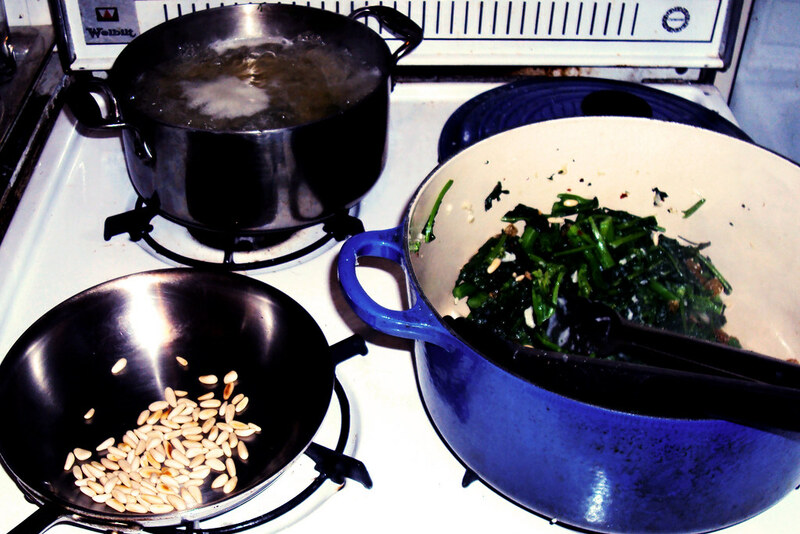 Bring a large pot of salted water to a boil and blanch the broccoli rabe for 2 minutes. Remove broccoli from water with tongs and place on cutting board and chop into 1 inch pieces. While the pasta cooks, toast the pine nuts in a small pan over medium to high heat, 3-5 minutes. Keep an eye on them so they turn golden brown but don’t burn. Drain the pasta when it’s done and return to cooking pot to keep warm for a couple minutes if need be. Put oil in a large pot over medium heat and add the garlic and red pepper flakes and cook for about two minutes or until garlic starts to barely brown. Add the broccoli rabe and a pinch of salt. 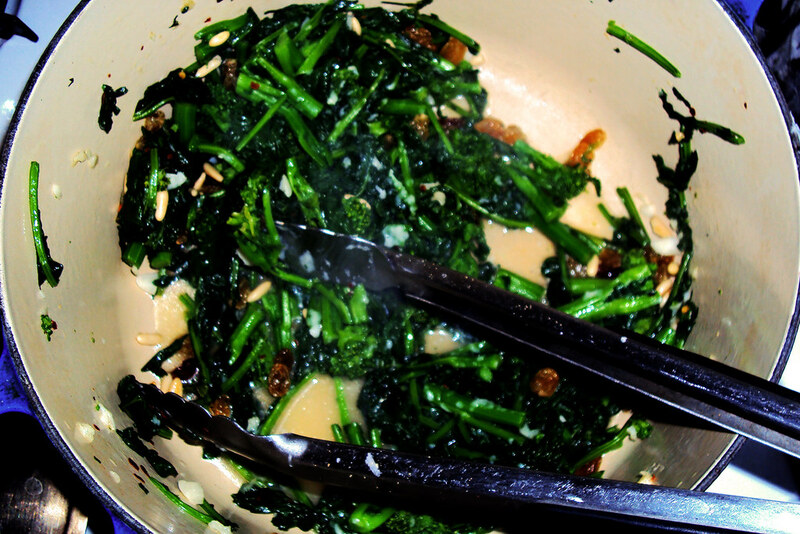 Toss broccoli rabe to coat in oil and garlic. Saute for 3-5 minutes. Add the golden raisins to the broccoli mixture and a generous splash of decent white wine. ( If you don’t have wine, stock works just as well, and in a pinch you can use water.) Turn the heat up slightly. When the raisins are plump and much of the wine evaporated, add the pecorino, about 1/3 of the parmigiano, and most of the pine nuts, reserving some for garnish and incorporate it all together. Plate It Up. Ladle a generous mound of pasta in each bowl and sprinkle generously with parmesan. Add a heaping portion of the broccoli rabe mixture. Sprinkle with more cheese and toasted pine nuts. 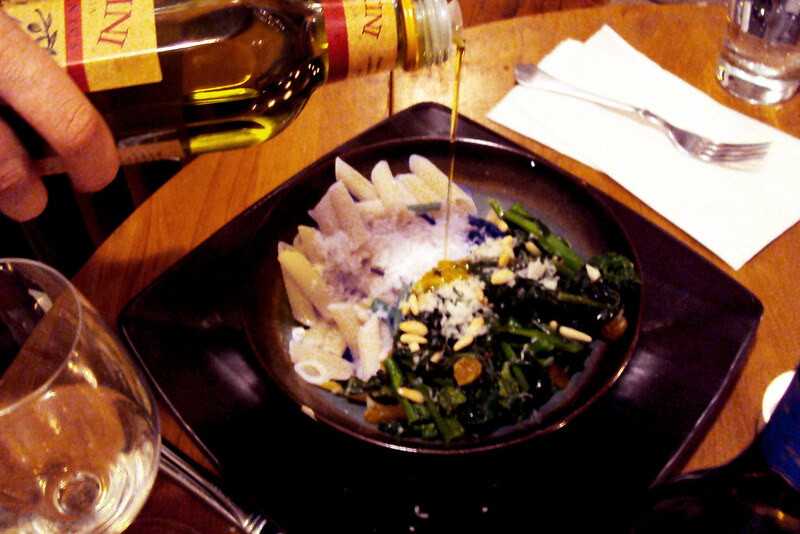 Finish with a drizzle of high quality olive oil. YUM! This looks like something even I could make. Thanks Kate for making me feel better about myself in the kitchen! Definitely trying this soon.